I will remain calm! I will remain calm! I will remain calm! I will remain calm! Grilled cheese sandwiches! I will remain calm! Those of us Twitter refugees that also use FriendFeed accounts with it have made our way over there and are using the #TwitterFail hashtag, come join us if you want to witness the end of the world as we know it! Laugh as much as you want, but it's got to the stage where Twitter has become such an integrated and instant part of my life that using the regular internet feels like going back to newspapers in information delivery speed. Once you get the taste for instant information from close friends, people you're interested in and news sources from around the entire planet, you're hooked. Open services (based on Laconi.ca or anything else) really need to take off, it's got to the stage where this infrastructure is simply too important for one company to control… and mess up. 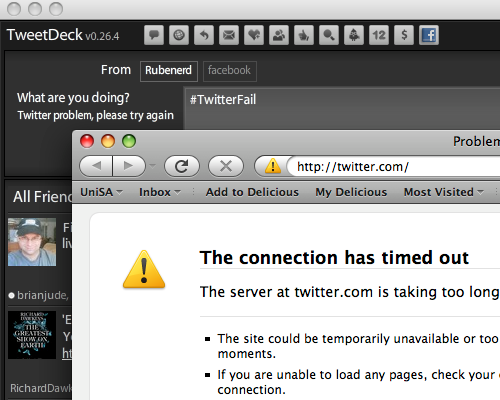 I tell you what though, it does make this post I created about Twitter only a few hours earlier look quaint doesn't it?